The Pinnacle Twins & Porter Cable 7424XP is a two-step paint correction system. Use this kit on all types of paint. 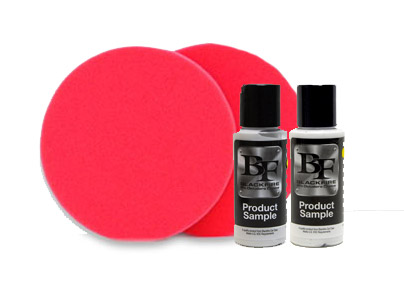 Kit includes low profile 6.5 inch foam pads by Lake Country. 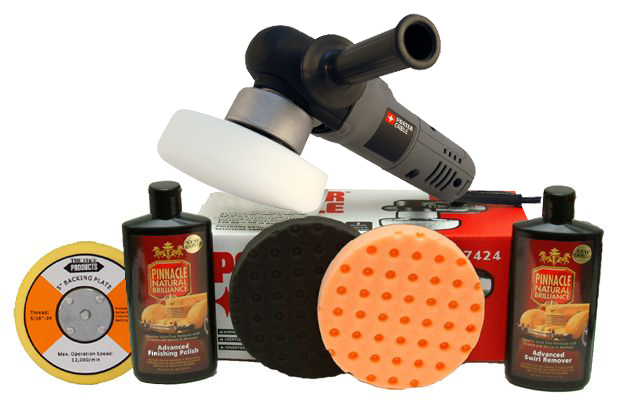 The Pinnacle Twins & Porter Cable 7424XP Kit is a fantastic choice for anyone who wants a simple and effective swirl remover kit. The first step is Pinnacle Advanced Swirl Remover to correct mild to moderate imperfections. Step two Pinnacle Advanced Finishing Polish takes care of the rest. Simple. Pinnacle Advanced Swirl Remover brings �user-friendly� to a whole new level! Diminishing abrasives and water-based lubricants blend away imperfections gradually, leaving a smooth paint surface. This tempered approach to polishing eliminates imperfections while being extremely gentle on the paint. Pinnacle Advanced Finishing Polish gives your vehicle�s paint maximum impact with a clear, reflective gloss and flawless appearance. With micro fine diminishing abrasives, Pinnacle Advanced Finishing Polish burnishes paint to a crystal clear gloss that looks and feels mirror-smooth. The CCS Orange 5.5 Inch Cutting Foam Pads is included for general swirl and defect removal. Orange pads are less aggressive than the yellow pads. Use the orange pad to apply swirl removers and polishes. The CCS Gray 5.5 Inch Finishing Foam Pad will apply waxes and paint sealants flawlessly. The soft foam is firm enough to remove light buffer swirls during final finishing.